No, I'm not a super organised person, nor do I have a big fancy kitchen or any fancy gadgets and I'm certainly no super-mum but I still find the 5 minutes each day to bake bread. Yep, that's right, I said... 5 minutes. How can I bake a fantastic loaf of bread with approx. 5 minutes preparation? ... see below for the super-duper easy recipe. ~ I often substitute the water for vegetable juice, I have made beetroot bread, spinach bread, carrot bread - all totally yummy & just last night we had carrot/spinach pizza dough! ~Mix all together in a big bowl & put aside to rise. ~ When ready to bake, the dough will have risen & look 'wet'. Just use a scraper to scrape the dough from the sides of the bowl and scrape it into the prepared tin/tray. Remember, you DO NOT need to knead this bread - trust me on this! ~ I then pop it into the oven, turn the oven onto 200 degrees Celsius and leave for 45 mins. ~ leave to cool & munch for lunch or dinner or breakfast! ﻿﻿Now, go on, bake yourself, your family & friends some bread! Remember to show me your 'loaf'! Tag you pictures on Instagram #5minuteBread or post a piccie to the CraftyRie page on Facebook or post piccie to your blog & leave a comment (& link) below. 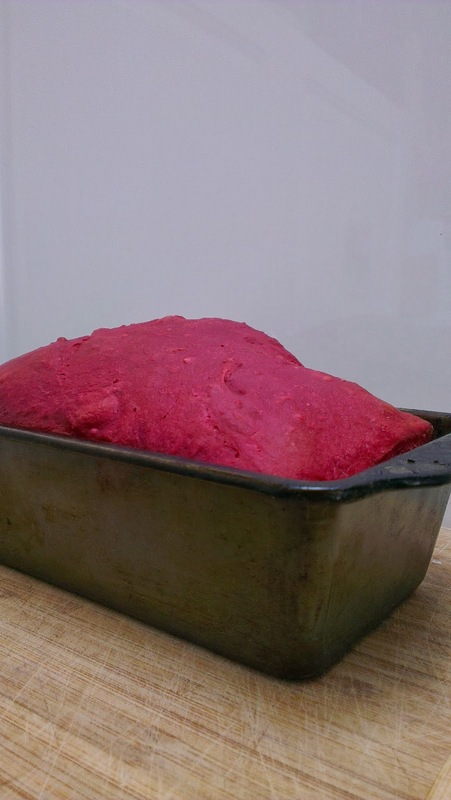 This bright purple bread is Beetroot Bread! Thank you for the conversion, have to try this today! Sorry Fiona, you made me giggle - are there no scales in the USA? I just flip the bowl onto the scales & hit the grams button then the mls button for the liquid (it defaults to ounces) and use that rather than cups - much easier for me as I don't have to then wash the measuring cups! !